I was talking to a few ladies in my class this week about the Thanksgiving meals we remember from our childhoods and how they have evolved, if at all. We celebrated with my mother’s family some years and with my father’s family other years. Even though my mother’s family is Italian-American, their Thanksgiving dinners were pretty straightforward, even including sweet potatoes with marshmallows. My father grew up in Italy and therefore Thanksgiving was truly a foreign concept. Suffice it to say, that side of the family served ravioli as a first course. No, not pumpkin ravioli with brown butter and sage. Cheese ravioli with marinara sauce! Cracks me up to think about that now. Then the discussion transitioned to new recipes which have made it onto our Thanksgiving menus in the last few years. That’s a tough one, no? I’ll tell you right now, I teach 5 new recipes every November and very few make it to my personal Thanksgiving table. Not because they aren’t fantastic, but because how many recipes can you really have on one menu? At some point, enough is enough and my menu has been at capacity for a few years now. 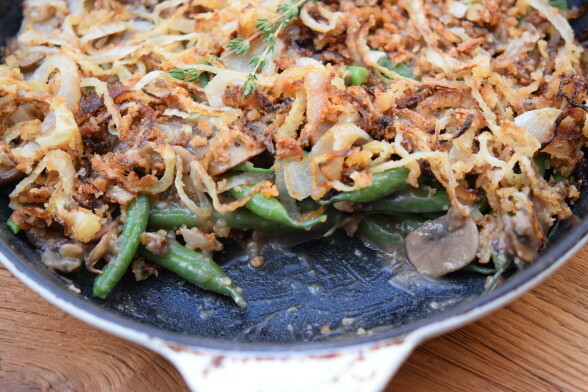 But, allow me to introduce a favorite newcomer to my Thanksgiving spread…..green bean casserole! 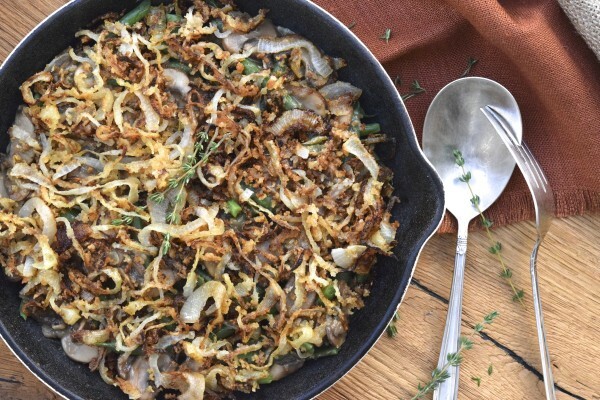 But not just any green bean casserole. I am not talking about canned green beans, coated with cream of mushroom soup and canned fried onions. Thanksgiving deserves more respect than cans, people. Sure, we can use heavy cream and loads of butter instead, but we don’t have to. bake when the turkey is resting out of the oven. See you back here next week with some more fabulous Thanksgiving recipes and tips! 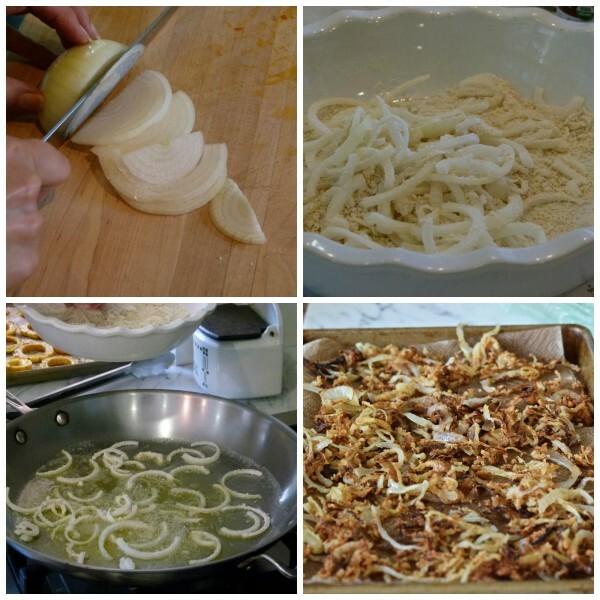 Make the onion topping: Combine the onions, flour, panko and salt in a large mixing bowl or paper bag and toss to combine. 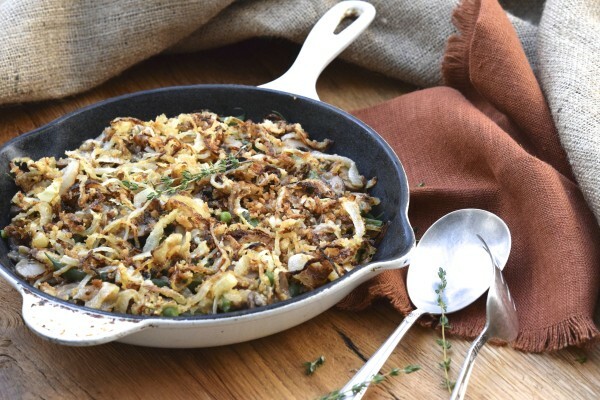 Warm 1 ½ Tablespoons of butter and 1 ½ Tablespoons of oil in a large skillet over medium heat. Drop one piece of onion in the pan to make sure it sizzles. Add as many onion pieces as can fit in the pan in one layer. You may need to do this in batches. Turn the onions when they become golden on the bottom. Cook until crispy and golden on the other side. Transfer onions to a plate lined with a paper towel. If you have to cook a second batch, you may need to wipe out the pan and start with fresh butter and oil. 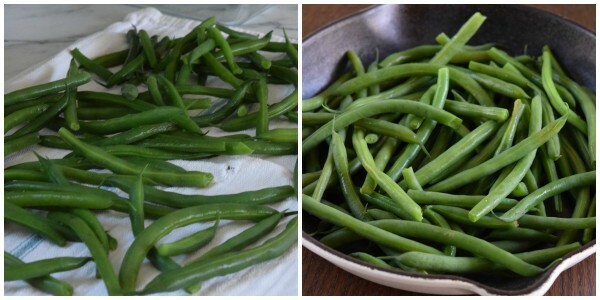 Blanche green beans: prepare a bowl of ice water for the green beans. Bring a large pot of water to a boil and add the kosher salt. Add the beans and set a timer for 3 minutes. Drain and immediately submerge in the ice water bath. Drain after 5 minutes or so, pat dry, and place green beans in a 9” square or round baking dish. Melt the butter in a medium skillet, add mushrooms, season with salt and pepper to taste, and sauté over medium until mushrooms have lost their shape and released most of their liquid (about 5 minutes). Stir the flour and thyme into the mixture and cook for another 1-2 minutes. Add the mushroom stock, Worcestershire sauce, and salt and pepper. Bring to a simmer and cook until the sauce has thickened, stirring occasionally, about 6-8 minutes. Taste for seasoning. 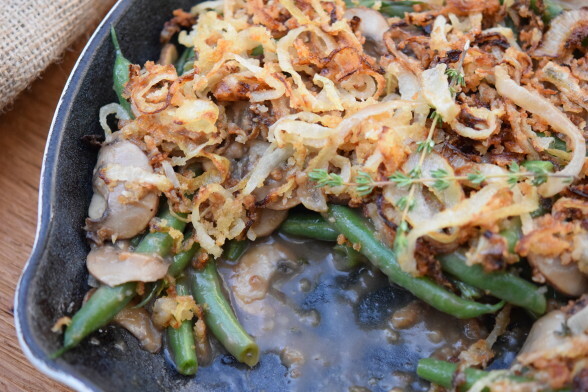 Pour evenly over green beans, top with the crispy onions and bake at 350 degrees until bubbling on the sides and the beans are warmed through, about 15-20 minutes. Serve immediately. 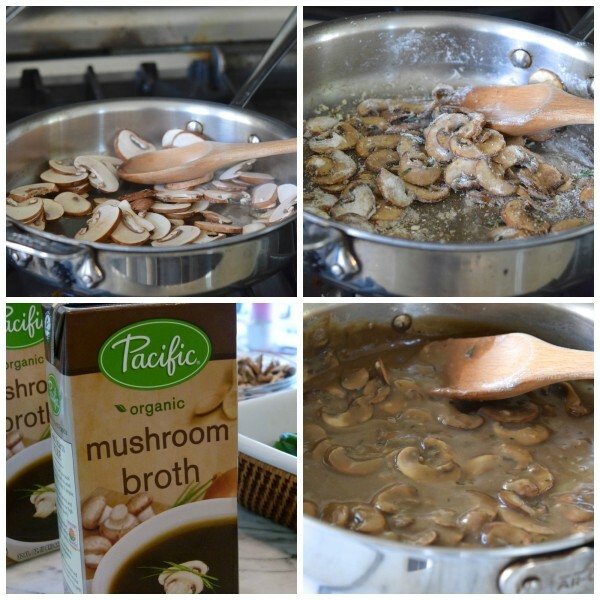 Where can I find mushroom broth? Can this be made ahead and kept in fridge? If so, any tips or changes? I suppose you can make it up to the point of baking and refrigerate it. Don’t do the onions until the morning of, if possible so they stay crispier. Keep some extra stock on hand if the casserole seems too thick. If you double the recipe – do you use a 9 x 11 baking dish? I noticed that in the pictures ,you used an oven safe skillet to assemble and bake the casserole. Is there an advantage to doing that versus a baking dish? Thanks for you help. How do you think this would be if I used all rice flour and gluten free panko in order to make it gluten free? I think it would be great! I might suggest a good GF flour blend though, instead of the rice flour which can be a little gritty. Have you tried King Arthur Multi-purpose GF flour? I use that one a lot with excellent results. Looks delicious! Sorry if I missed it, but couldn’t find- how many would this recipe serve? I wonder how many times you double this as I now you cook for a big November crowd. Thanks!!! My bad, I forgot to add that. Serves 4-6, but on Thanksgiving you’ll have other sides and people might only take a taste. I made this recipe x4 last year for 34 people (many of which were kids, though) and it was the perfect amount. I can’t wait to try this recipe!! Can I replace the butter with earth balance to make it vegan? If not, what do you suggest? Most definitely! I’ll adjust the recipe to reflect that.